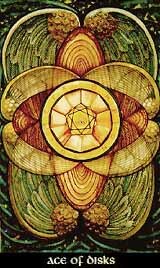 The Ace of Disks represents the entity of the element Earth, the beginning of Assiah, the material world of making. It stands for the pureness of the element, and also for its seed, the first little sprout that later becomes a tree. So the Ace of Disks can stand for the beginning of a material subject, this can be a physical project or a material value, which could mean the urge to material creation or the chance for material gain.. But, the Disks not only represent plain materials, but the entire world of Assiah, the actual, physical earth of daily life, and the actual, physical body of the human being. This implies home and profession, daily works, familiar bondings, health and well-being in common. And in this context, the Ace of Disks tells us that something will be created, something will begin.